Tenrecs are insectivores which occur both in Madagascar and Western and Central mainland Africa. There are around 35 species in Madagascar and at least six occur in Andasibe. The Common Tenrec (Tenrec ecaudatus) is, as its name suggests, fairly common and found throughout the island, including Andasibe. It is the largest tenrec, bigger than a common brown rat, and can be seen during the day or night though it is primarily nocturnal. Extraordinary for a mammal, they have been known to give birth to as many as 32 young! The Lowland Streaked Tenrec is commonly encountered around Andasibe. They make a rattling sound with their spines to warn predators and often are heard before they are seen. The Lowland Streaked Tenrec (Hemicentetes semispinosus) is perhaps the most striking, with elegant black and white stripes down its spined back. Often they can be heard before they are seen, clicking their spines in a raspy rattle to warn you of their presence. They form burrows, often near small streams, and here they give birth to around half a dozen or more young. The Greater Hedgehog Tenrec (Setifer setosus) is the other spined species in Andasibe. Unlike the Lowland Streaked Tenrec, it is rather drab in appearance. When threatened they may curl into a ball. Shrew Tenrecs are not often encountered and when they are may be misidentified as rodents rather than tenrecs. The genus Microgale is commonly called Shrew Tenrecs. At first appearance they may be confused with the likely exotic true shrews (Suncus spp.) which also are found in Madagascar. Of the 35 or so species of tenrecs, more than 20 are Shrew Tenrecs, and in Andasibe we have at least one species, likely more, but they are not often encountered and when they are often misidentified. 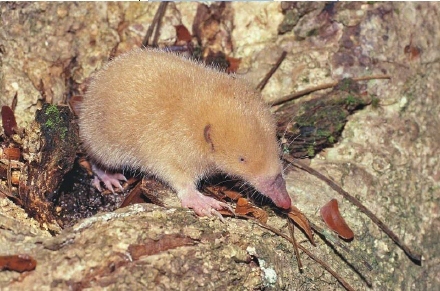 The Mole-like Rice Tenrec lives underground and is rarely observed. 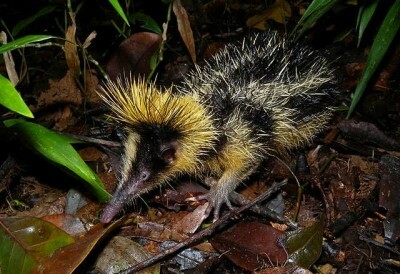 The final two species of tenrec in Andasibe have only rarely been encountered. The Aquatic Tenrec (Limnogale mergulus) has webbed feet and inhabits rivers, where they may be mistaken for rats, while the Mole-like Rice Tenrec (Oryzorictes hova) lives a fossorial existence mainly underground. Madagascar has an interesting diversity of rats and mice. Perhaps the best known is the Giant Jumping Rat (Hypogeomys antimena) which is restricted to a tiny remaining piece of habitat in the west, but the area around Andasibe also supports some interesting less known rodents. There are at least three species of Eliurus in Andasibe. Commonly known as Tuft-tailed Rats, they are nocturnal and can be seen climbing branches and vines in the forest on night hikes. 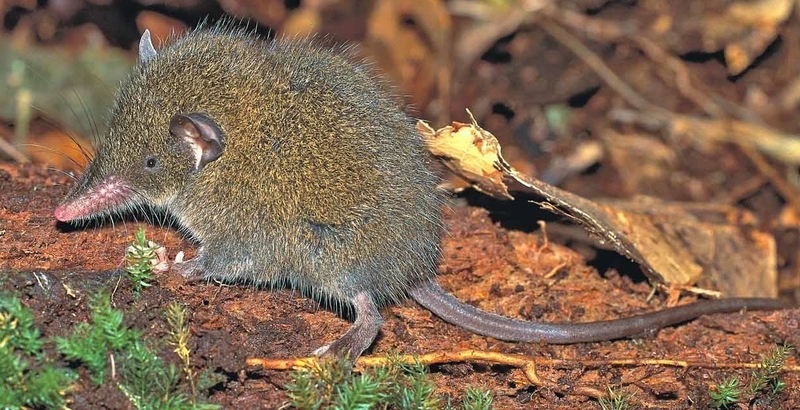 The Voalavoanala (Gymnuromys roberti) is terrestrial and found in forests at night, with a white belly and gray dorsal side, while the two Brachytarsomys species in Andasibe look much like voles and live underground. 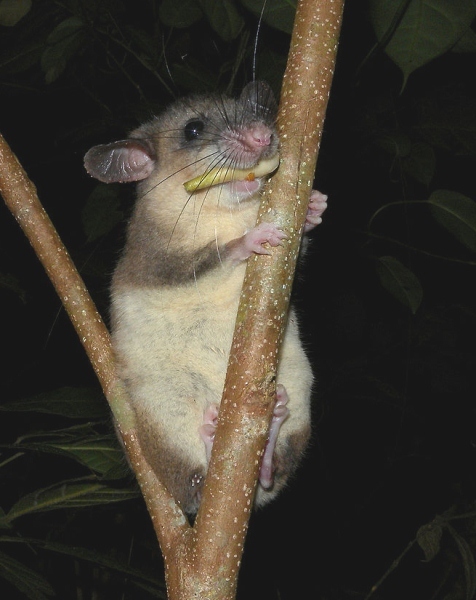 If you wish to view the unique rodents of Andasibe, it is important to search at night when they are active and can be seen in the forest. Madagascar supports at least two dozen endemic species of bats. Unfortunately, the bats of Andasibe do not receive much attention from visitors and tend to be overlooked compared to the other fauna, even though as many as 21 species have been recorded in the area. Madagascar Flying Foxes (Pteropus rufus) can be seen in the thousands north of Moramanga roosting in fruit trees, while perhaps the best bat experience of Andasibe can be had in the village. The attic of the post office is home to a large bat roost and is conveniently located next to a small shop that sells beverages. Watching the bats come out at sunset while sitting on a bench outside with a cold Three Horses Beer in hand is an experience not to be missed, whether you like bats or not! This is the realm of the lemurs, both diurnal and nocturnal. While the enigmatic Greater Bamboo Lemur (Prolemur simus) is the rarest of the Andasibe region’s 14 species, the eerie song of the Indri (Indri indri) is the epitaph of Andasibe. Indri are easily found with the help of local guides in the morning within Analamazaotra Forest Station, an experience not to be missed while visiting. Next to the Indri, perhaps the next two most charismatic lemur species of Andasibe are best searched for in the forests north of the village, at Torotorofotsy and Mantadia National Park. 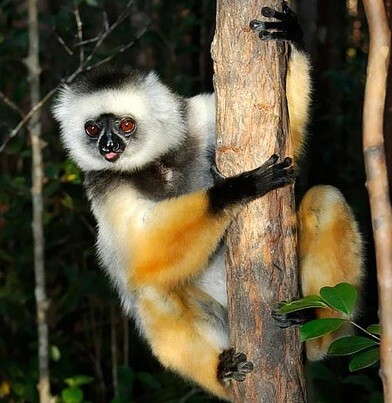 Here it is possible — with some luck — to observe the Diademed Sifaka (Propithecus diadema) and Black and White Ruffed Lemur (Varecia variegata), the latter more often heard than seen. Diademed Sifaka are best viewed in Andasibe-Mantadia National Park. A tiny local endemic only described in 2005 – Goodman’s Mouse Lemur (Microcebus lehilahytsara) — as well as Dwarf Lemurs (Cheirogaleus spp. 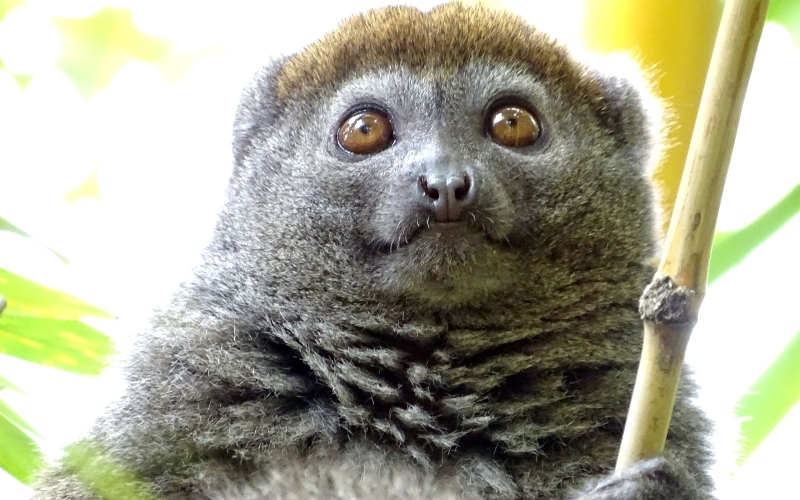 ), the Eastern Woolly Lemur (Avahi laniger) and the Greater Sportive Lemur (Lepilemur mustelinus) are all common nocturnal encounters. Less often stumbled upon at night is the Hairy-eared Dwarf Lemur (Allocebus trichotis). Andasibe is also home to the seldom seen and bizarre Aye-aye (Daubentonia madagascariensis). 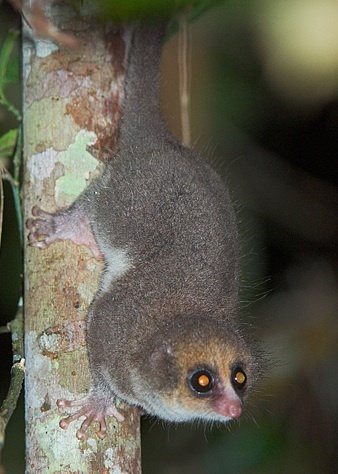 The infrequently observed nocturnal Hairy-eared Dwarf Lemur (Allocebus trichotis). In addition to the Greater Bamboo Lemur, the more widespread Lesser Bamboo Lemur (Hapalemur griseus) also inhabits the forests around Andasibe. As their name suggests, the majority of their diet consists of bamboo, though they also will feed on leaves, fruit and flowers. If there is only one lemur that will be seen while in Andasibe, it is the Common Brown Lemur (Eulemur fulvus), which can even be found scrounging around the garbage of the National Park entrance in search of leftover banana peels or mango rinds. Next to humans, the main predator of the above lemurs is the Fossa (Cryptoprocta ferox), the largest carnivore in Madagascar. Though at first glance they may look like a large muscular feline, they are in fact related to mongoose, as are all carnivores in Madagascar. 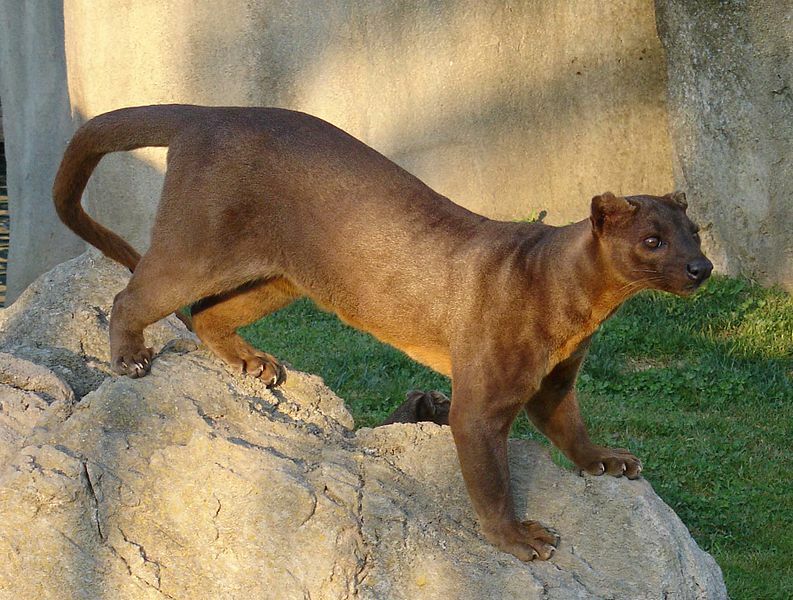 The Fossa, Madagascar’s largest carnivore, is found in Andasibe but rarely seen. Photo (taken in captivity) by Ran Kirlian. In Andasibe, the Fossa seems to be rare but occasionally a spotting is reported during their mating season between October and December when males leave their solo lifestyle and together congregate around a mate. Not to be confused with the Fossa, though its scientific name does just that, the Fanaloka or Malagasy Civet (Fossa fossana) is the size of a large housecat and patterned in elegant black bands and spots. They are nocturnal and very rarely found. 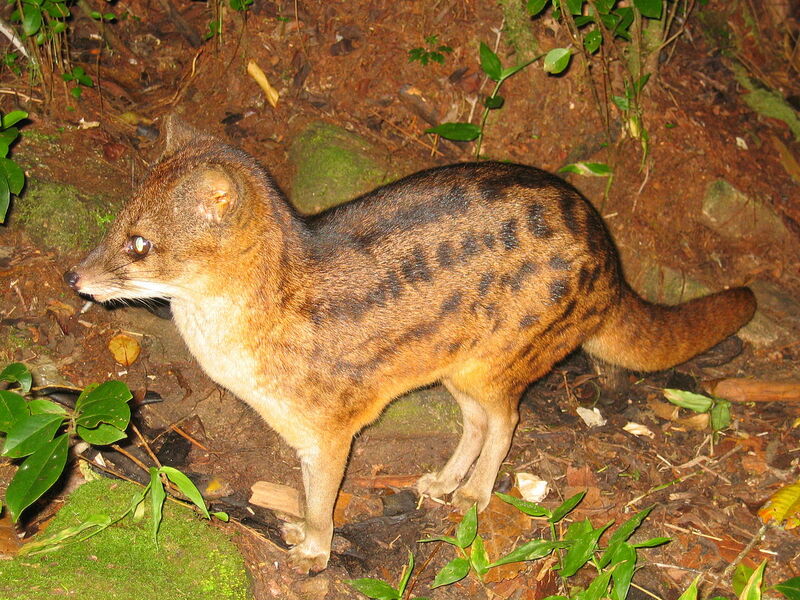 Fanaloka (Fossa fossana). Photo by Joaquín Romero Redondo. Similar in size or slightly larger than the Malagasy Civet is the Falanouc (Eupleres goudotii), which have an awkwardly broad tail and angular pointed snout. 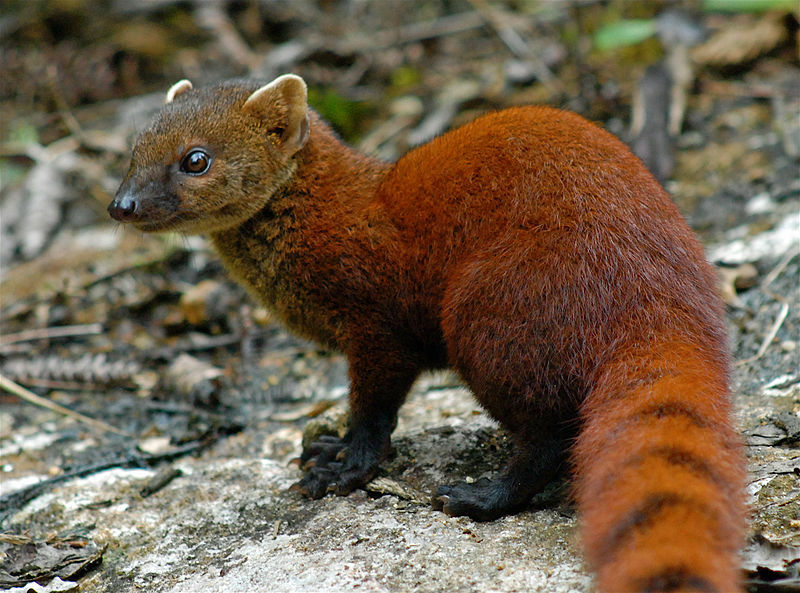 The most commonly observed carnivore may be the Ring-tail Mongoose (Galidia elegans), which of the four carnivores of Andasibe is the only one active during the day. They are small and weasel-like in size and shape, with an elegant banded tail and russet body. The Ring-tailed Mongoose is active during the day and occasionally encountered. Photo by Jeff Gibbs. There are unconfirmed reports that Malagasy Striped Mongoose (Galidictis striata) and the exotic Small Indian Civet (Viverricula indica) may also be found in Andasibe.